It all started with a grant from “Awards For All” in November 2003. The project, based at Livability Holton Lee, initially ran for just one day a week over fifteen weeks – hence the name! The project has now grown to four days a week, with over 40 people attending, all made possible by a dedicated team of teachers and volunteers. 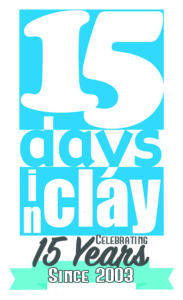 15 Days” is open to anyone, whatever their ability or experience, who shows an interest in working with clay. From the beginning, this unique project has provided many new opportunities for self-expression, confidence building and personal growth. The individuals are taught in a non-threatening and supportive environment. Learners become confident to explore all methods of ceramic construction and decorating. Each learner makes their own decisions about what they want to make. The teaching develops their practical knowledge of ceramics and creative skills: many are now on their way to becoming artists in their own right! Over the past 15 years, the artists have exhibited successfully: as a group; undertaking solo shows; and by individual commissions. Volunteers often return to the workplace: several have started their own ceramic businesses. Some artists have successfully achieved nationally recognised qualifications. There have been countless examples of “15 Days” enriching individual’s lives in both physical and mental well-being and confidence building, opening themselves to creativity and the benefits it brings.